I think it is the goal of Central Florida reporters to put me on the news when I look my most ridiculous. As if being filmed in my orange sweatpants on Monday wasn’t bad enough, today Ryan and I were interviewed about the unbelievably cold weather in Orlando on our morning walk with Sadie. I was wearing a sports bra, tank top, hoodie, fleece jacket and a regular winter coat… with two hoods and a beanie. I looked like an oompa loopa! Even Sadie had double layers on this morning. I’m sure that when the reporter saw me in my 80 layers and Ryan shivering with his hood up, she thought “Jackpot!” We definitely were the spitting image of freezing weather, I’ll say that much! It was great to have Ryan’s company on our 2.5 mile walk because talking to him distracted me from the cold… until the wind started blowing. Brr! We went on our walk after getting nice and sweaty at the gym. I trucked along to my new favorite Run, Run, Run Playlist. All of the upbeat songs lit a fire under my feat! 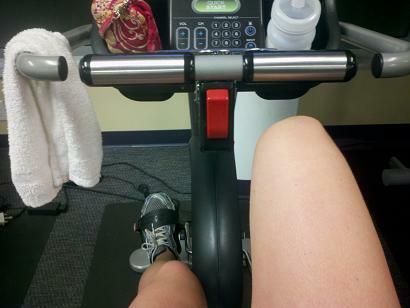 I then waited for Ryan to finish up and did 10 minutes on the elliptical before switching to the bike where I peddled to absolutely no resistance while reading blogs. Ryan actually laughed when he saw me chillin’ on the bike, reading blogs and clearly wasting time. Fortunately that only lasted for about two minutes until he was ready to leave. After our cold walk with Sadie and our run in with the news, we came home ready for a hot meal! I made my new breakfast lover sandwich. This is my favorite breakfast of the year! 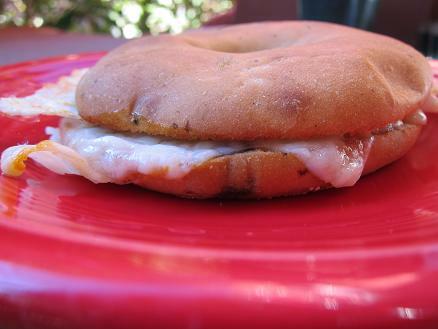 Yes, we’re only into the second week of the year, but this hot breakfast bagelwich is taking the lead. 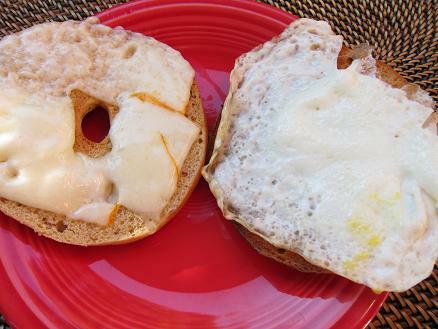 The combination of the cinnamon raisin bagel with the muenster cheese and egg creates a party in your mouth. Why I'd Love a Bite, Thank You! Time to work! Can you believe it’s already Thursday!? It’s SOOOO COLD, I agree!! Though it beats the teens at home. Can’t wait to see you tonight! You must be destined to be on camera or something! 🙂 I am definitely buying some cinnamon raisin bagel thins today when I go to the grocery store…you make them sound so yummy! YIKES!!!! haha you are so famous girl! Just found your blog yesterday on Fitnessita’s blog roll – I’m obsseded! You have so much good info on here – I already put a list of “preventing late night snacking to-dos” on my fridge. Oh and that breakfast sandwich looks amazing. awwwwwww that’s what I wanted for breakfast.. I wasn’t happy with my breakfast this morning. I laughed out loud when I saw that not only did you have layers…but SADIE had layers! Too cute! hahaha! 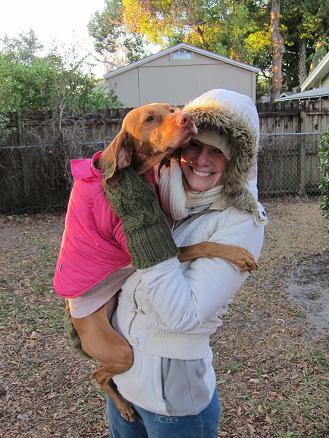 Yeah, I can see why the news reporter picked you … but really, it’s all about KEEPING WARM OUTSIDE in COLD TEMPS! I’d have looked just as layered up as you. haha, love that the news people love you! That is awesome that you got on the news again! I can’t believe it’s even that cold in Florida. 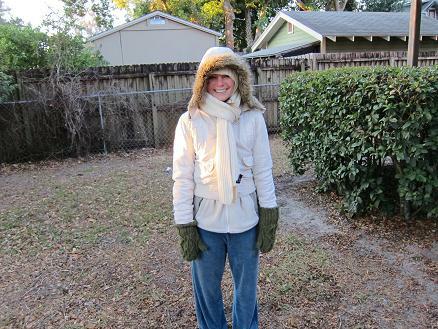 When I went to Disney World two years ago in December, it was freezing like this. Love that bagel sandwich. I’m going to have to try making it. 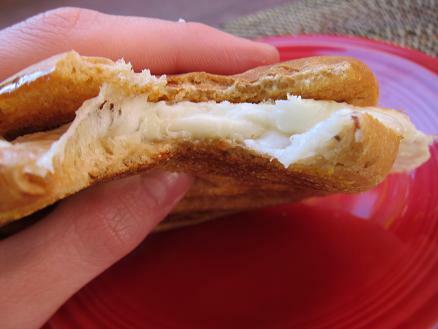 I love egg and cheese sandwiches, quick, easy, nutritious, and delicious! Love your coat! Cant believe its that cold there, I know it warms up though in the day right? Have a great day girl! On the news twice in one week! You are famous (or something). 🙂 That breakfast sandwich looks delicious. Exactly what i’m craving this morning. Loving the look of that sandwich, especially on such a cold morning! How funny, bundled up on the news! Have you seen the clips? no – haha, i should check their website… though i may not want to see them! i probably have cold boogers or something. ahahha thats so funny you got interviewed again! that’s certainly more than i’ve gotten in my..lifetime! Love all the layers! A tip to battle the cold on your walks… change your sports bra! It’ll make you super cold once your body temp cools down and the sports bra is still sweaty. But then again, if you do that, you might as well shower and change everything. So I guess it just depends on what you feel like doing! you’re just a camera favorite! Julie you look so silly but in a good way. It looks like we stuck a person who never has seen snow in her life and put her in Antartica lol and this was the result! My secrets for dressing warm is spandex under jeans and a long jacket over everything! haha! Its okay…you look beautiful no matter what! Too funny though! I always see people on my walks when I look my absolute worst. I am totally going to try that cinnamon rasian and cheese and egg combo! Its sounds like a yummy sweet and savory trick in my mouth! We are having the same type of weather here in Tx. I find that long underwear makes a BIG difference in how much of the cold I feel. 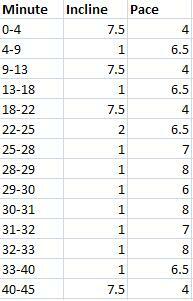 The top is never the problem because I always bundle up but the cold wind hitting my legs made the warmth go away. Wearing just the bottoms keep me soo warm I actually enjoy my walks in the cold. Really works, you should try it. Can’t believe noone said they ate your breakfast and they were sorry just to get a cute pic of Sadie licking the camera! I think I’m going to try this breakfast tomorrow though because it looks like it’d definitely hit the spot! So I’ll get back to ya 😉 Thanks for the idea! I made this sandwich for dinner today because I’ve been thinking about it since the first time I saw it on your blog- Amazing! I’m obsessed haha. Hahaa so funny, Jul! Love your ensemble!